The 3 days training last weekend was great except that the last day it went a bit over time that most of the audience had to hold back their hunger until the training was over. For Hobbit and I, we made plans that we would go to Jangwon at Sukhumvit Plaza for our favorite bibimbap after I am done with (phenphedrine review)the training! Therefore as soon as we collected our pins and certificates, we drove through Sukhumvit road all the way to Sukhumvit Plaza. 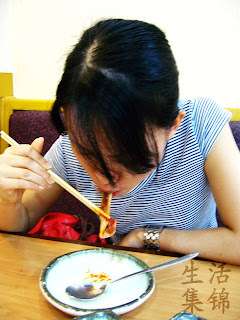 The prolonged hunger made us eat like nobody was watching and slurped every bit of the kimchi's juices like greedy dogs! Oh well, it's only fair that I review the restaurant we went to in my foodblog since I have one (but never update*_^). The place is really good. One thing Hobbit and I can say about this restaurant is the excellent service and autenticity of the food. Hmmh yummy! Certainly the prices are pretty much affordable too!